A friend asked me if I would teach her how to make a cake for her daughter's birthday. She wanted a cake that was not too difficult to make for a novice baker, and one that her little girl could get involved with too. We decided to make a 4 colour rainbow cake (recipe below), covered with white buttercream icing as a canvass for her daughter to stick candies into as decoration. The rainbow piped trim hints at the surprise hidden inside. 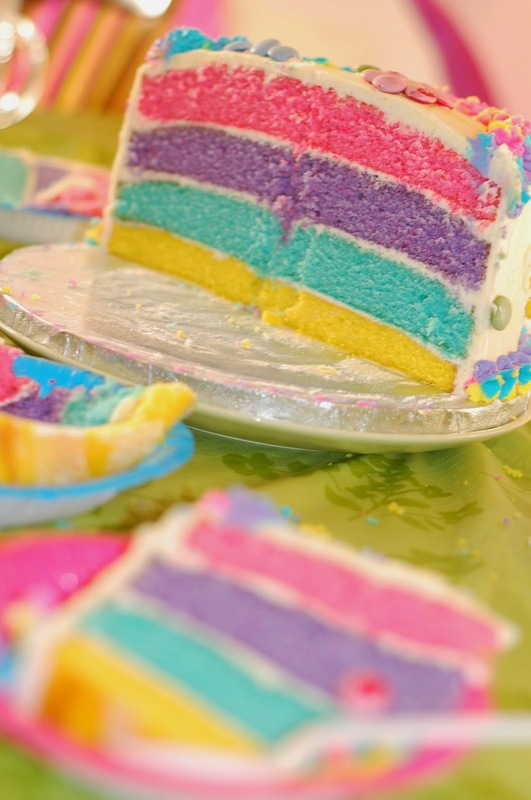 Everyone was delighted when the cake was cut open and the brightly coloured sponge was revealed. We also got the children at the party involved in a bit of baking - they each got a ball dough to roll out, cut and decorate, to make their own gingerbread cookies (recipe). Evenly divide cake mixture into 4 or 6 bowls (depending on how many colours you want in your rainbow). Add a few drops of different coloured food gel to each bowl and mix well. Pour two of the coloured batters into the two prepared cake pans (one into each pan). Cover the remaining batters with cling film so that they don't dry out. Bake for 20-40 minutes or until a skewer inserted into the centre comes out clean. The cake will also just have pulled away from the sides of the tin when it is done. Leave cakes to cool in the pans for 10 minutes, then carefully turn out and leave to cool on cooling racks. Clean cake tins, then grease and line them again. Bake the next two colours as above. Repeat until all the colours are baked. Once all the sponges have cooled thoroughly, sandwich them together with layers of buttercream icing. Cake can be left 'naked', covered in buttercream, or crumb coated with buttercream then covered with fondant. Elaine is amazing teacher!! Everybody loved the cake, not just for how it looks as well how tasty it was. Thanks!!! Hie Elaine. I just love you vanilla sponge cake recipe as well as the Chocolate one. Everyone that Iam baking for is falling in love. Thank you so much for your kindness and generosity. Would you mind also sharing your red velvet cake recipe?